CD Projekt: "Let's Treat Gamers as Grown-ups"
As the saying goes, you catch more flies with honey than with draconian DRM. It's rare to find AAA games without some sort of DRM protection these days. Even though it often causes more harm than good, most publishers are sticking to their guns in the fight against piracy. CD Projekt, developer of the Witcher games and the company behind GOG.com, has a different philosophy. Longtime believers that DRM is useless, it simply doesn't use any. It's an unusual business strategy, but it's worked for the studio, and apparently the secret was simple: respect. "We want to treat gamers in a way we would like to be treated ourselves," says CD Projekt RED's Konrad Tomaszkiewicz, "which sometimes means being rebels in the industry. That's why our games - both developed or sold on GOG.com - have no DRM, we take much care about our customers long after the release. Those are our ideals and staying true to them is the best way to acquire great and faithful fans." It says something about the current state of the industry that "trusting customers" is a novel concept for a studio. The philosophy extends to CD Projekt's game design. When asked about the secret to nailing mature settings, Tomaszkiewicz answered, "Don't get too preachy and let gamers judge what's going on the screen for themselves. Look at The Witcher 2 - we give the gamers unclear moral choices, but they have to decide which one they will take. Let's treat gamers like grown-ups and let them use their own moral judgments. Part of CD Projekt's respectful treatment of their fans is supporting their products after launch. "We've always believed in free DLCs," Tomaszkiewicz said. "The thing is that we consider DLCs as a normal post sale service, which shouldn't be priced. Back when retail games were dominant, we had expansion packs. These were really large chunks of content, which were worth their price. If today's DLCs offered the same amount of content, they would be worth paying for, but in most cases players think they are overcharged for what they receive. That's why we offer expansions to our game for free. This is also a way of saying 'thank you' to the people who decided to buy our game instead of copying it from an unauthorised source." Free additions to retail games may be part of CD Projekt's playbook, but that doesn't necessarily mean it's interested in joining the growing free-to-play market. 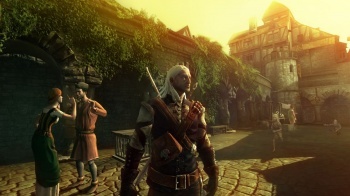 Tomaszkiewicz explained that microtransactions would ruin the carefully crafted atmosphere of CD Projekt's games. "I can't imagine pop out ads in a game where you have to immerse completely into the game world," he said. CD Projekt is currently working on Cyberpunk, a sci-fi RPG set in what Tomaszkiewicz assures is a "realistic and brutal world" much like The Witcher's.